Are you familiar with Robert Gagne’s Nine Events of Instruction? 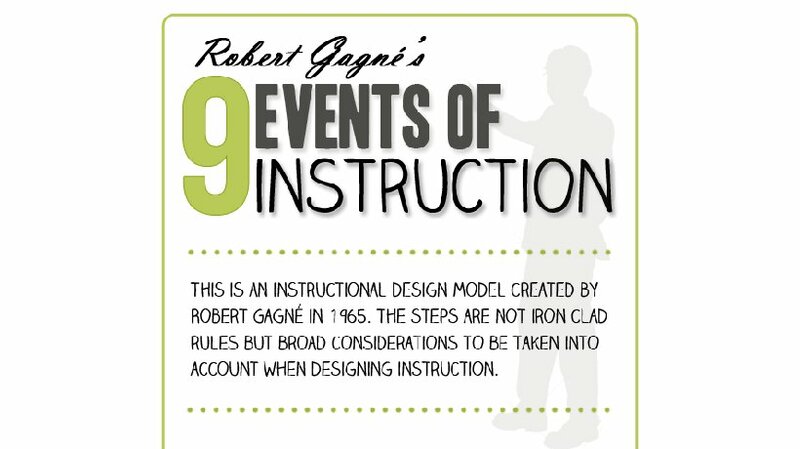 Would you be interested to see Robert Gagne’s Instruction Design Model; “The Nine Events of Instruction” Slideshare presentation and Gagne’s 9 Events of Instruction Infographic? It is true that I am a fun of Robert Gagne's instructional design model. I believe that the Nine Events of Instruction is the most appropriate Instructional Design Model for converting a traditional course into an eLearning format. (For more info please see the TOP 5 tips to Convert your Traditional Course into an eLearning format). 5 years ago I've created a presentation about Robert Gagne’s Instruction Design Model; “The Nine Events of Instruction” that I hope you will find informative. Feel Free to Embed the Slideshare Presentation at your site or blog! Also, I just found the Gagne’s 9 Events of Instruction Infographic by Nicole Legault. At her post you will find out how she created this awesome infographic. In case that you would like to create infographics you may find the List of Free Tools to Create Infographics useful!